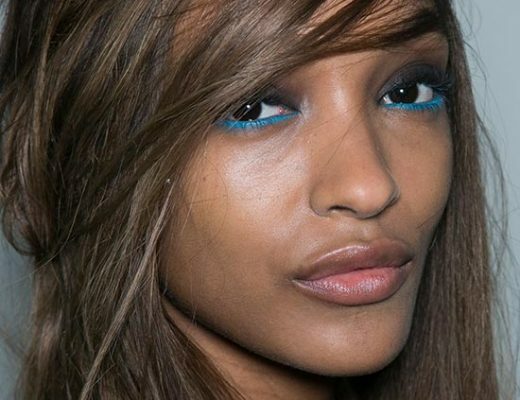 Celebrity makeup artist Beau Nelson was right – the ’80s are back! At the A/W 2009 collection, Giorgio Armani created a beautiful collection of 80s-inspired chunky knit cardigans, fitted jackets, tight leggings, pencil skirts, cocktail dresses and more in greys and blacks. And to go with the retro theme, models strutted around in a super tight updo with a bun on one side, strong, purple smoky eyes and fire-engine red lips. Hot! 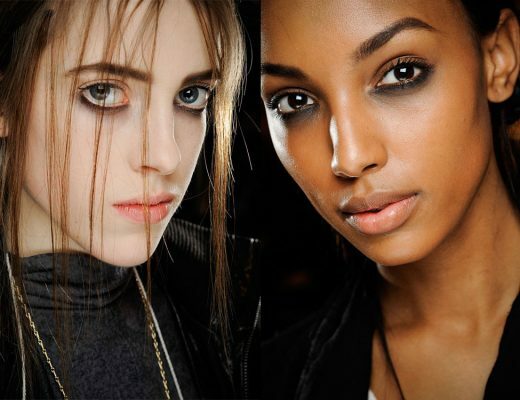 To go with the dramatic eyes and lips, makeup artist Linda Cantello kept models’ skin super polished with just the right amount of contouring on the cheekbones. On the eyes, she created a “cinematography feel” with a heavy-lidded look. She used a dark purple shade on the crease (try Giorgio Armani Eyeshadow in #5 or MAC Eyeshadow in Nocturnelle), extended it outwards and rimmed the eyes with black eyeliner. The eyebrows were kept soft and almost blurred out and mascara was applied only on the top lashes. 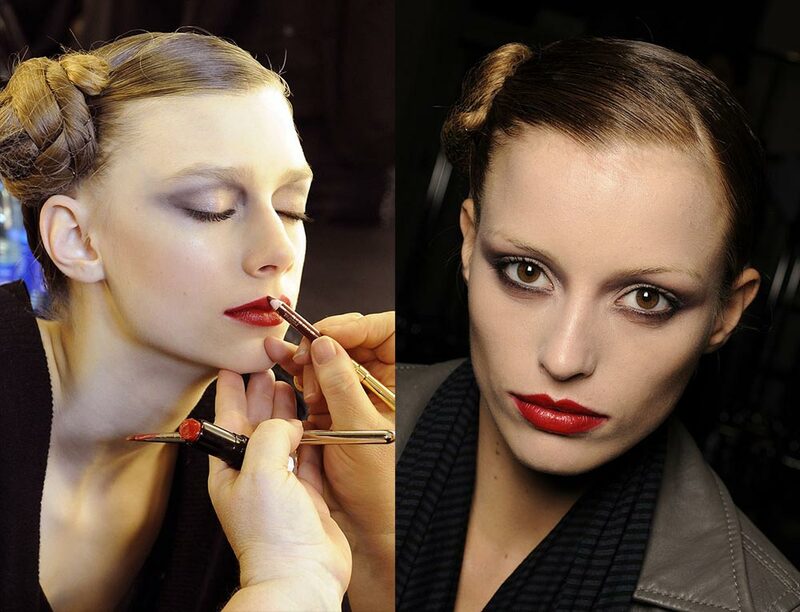 On the lips, the focus of the look, Cantello painted a new shade of red from the Giorgio Armani cosmetics line onto models’ lips to create a super defined, velvety lip. The lipstick will come out this fall and “it is made with a new pigment so it is a true red”, said Cantello. 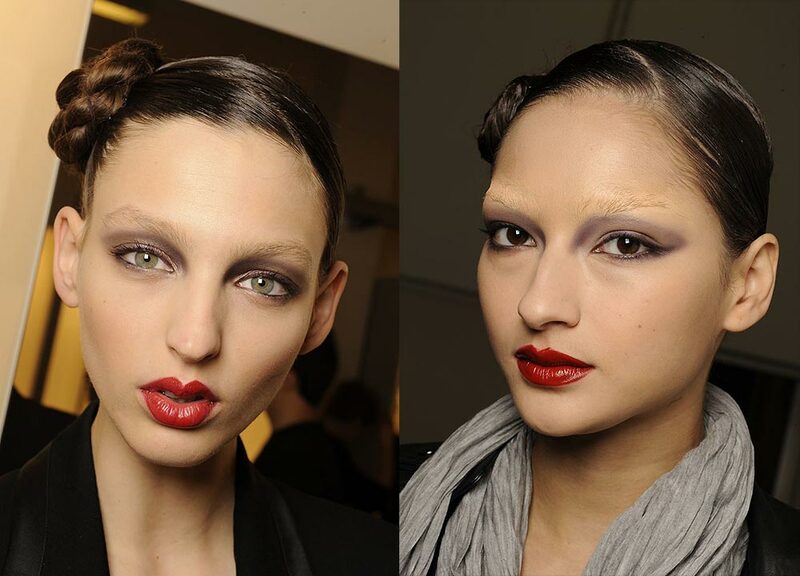 In the meantime, try MAC Russian Red Lipstick. Oh Phyllis, PLEASE do your take on these looks!